This week, ecologist David Paull published a scathing critique of the NSW Department of Planning. He explained how inside the walls of an old building Bridge Street near Circular Quay, the political planning deals that enable mining magnates to get their way are done. He spoke from bitter experience. Make sure you read his piece. Yesterday, I visited the old building to deliver a complaint. This complaint begins to reveal another side of these deals not just in mining but in development and transport as well. While key decisions may be made in Macquarie Street or in Bridge Street, an endless stream of bureaucratic processing papers over these hidden deals to provide a semblance of legitimacy to those decisions. Community consultation continues in name but even this minimalist consultation processes seems to be more deeply flawed than I had anticipated. I discovered this with a small investigation of some of the documents that have been lodged during for the WestCONnex M4 East approval process. Here is the letter of complaint. If you're in a hurry, don't miss complaint 6. Please contact me or write your own complaint if you know more. I wish to lay a formal complaint against staff in the Department of Planning for aspects of the handling of EIS process for the WestConnex M4 East project SSI 6307. The focus of this complaint is the handling, processing and publication of submissions in response to the M4 East EIS. It does not aim to cover many other complaints about errors in the EIS and the failure by the proponent to respond to points raised in the submissions, although these do concern me and could be the subject of further complaint. This complaint letter does not purport to be a complete set of all examples and evidence of the anomalies and failures in the submission process. The NSW government’s apparent determination to complete the approval process as soon as possible and the short period allowed for the public to make submissions to the New M5 project make the matters outlined below urgent. More evidence could be provided after I am informed how the Department deals with complaints of this kind. Other members of the public may come forward with other examples. I do however believe that the examples outlined below do provide evidence of a sloppy unprofessional and inequitable approach to the community that has pervaded and undermined the whole planning process. 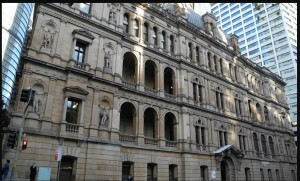 Before the final date for submissions for this project, hundreds of people and organisations wrote to the Planning Minister Rob Stokes requesting an extension to the submission period. This matter was also raised in Parliament. I am aware that many people did not even receive an acknowledgement, let alone reply to their requests. The Minister was told repeatedly a 55-day submission period was not enough time for the community to absorb and respond to this project’s massive EIS. Despite this, he failed to grant an extension. He has stated that he acts on the advice of your Department in such matters. Members of the public including myself who contacted the Department during this period were repeatedly told the matter of an extension was still under consideration. Ultimately, the requests were declined. It now appears that not only was there insufficient time allowed for the public to respond to this EIS, but there was also insufficient time for Department staff to handle the submissions process professionally, efficiently and fairly. The result is that members of the public and community organisations have been treated dismissively. The many anomalies in the process suggests that responsible staff are working under too much pressure or alternatively are merely complacent because they know the result of the planning process is a foregone conclusion. Whatever the explanation, the low standards of publication and analysis that your staff have applied to the thousands of public submissions is unacceptable for any project, let alone a hugely expensive taxpayer-funded one that will have a profound impact on the lives of so many people. This situation is especially disturbing because the submission process is the most important way that members of the public can engage with the approval process. I have identified several grounds for complaint. Instead of following the expected process, the Department delayed in publishing the agency and public submissions. When they were published, they were dumped in 61 PDFS. This was a breach of the Department's own undertaking to provide the public with access to names, suburb and content of each submitter. The Department misled members of the public into thinking that their submissions would be published clearly and transparently. Initially there was no way of identifying submissions. After verbal complaints were made to the Department by members of the public, myself included, a list of submitters was later published which identified submissions with numbers. This does allow members of the public to search for a range of submissions by identifying their number and then searching for that number on the PDFs in the Response to Submissions report. Unfortunately the list simply was added without explanation on the website about how members of the public can find their number in order to further track through the response to their submission, if indeed one is provided. This is far below the standard of publication offered for the two projects mentioned above. The Northconnex project also had a large number of submissions. No explanation has been provided for the change in practice. This deviation from standard process suggests some citizens are being treated more seriously and with more respect than others. Members of the public are entitled to be treated equally in relation to major project assessments, particularly when the EIS itself states the project will have significant negative impacts on their communities. As explained below the list of submitters is far from complete. Around December 18, 2015, I noted that one submission had been published differently from all others. The submission came from Mark Keogh and can be seen on the website here . Why is this? Why does one citizen get treated differently from others? The Department once again provides no explanation. The Department has failed to publish all submissions. b) I am informed by Colin Charlton that he submitted 8 submissions. Only one entry for Charlton’s submissions could initially be found in the 61 PDFs in which each submission is supposedly assigned a number. Colin Charlton queried this at an EIS exhibition session in St Peters on December 12. On December 14, 2015, a staff member in your Department informed him that his ‘submission’ was on the PDFS and had been assigned the number 4865. This was the number he had already found for one submission in the list of submitters. Recently, he has discovered that his other submissions were added at some stage between mid December 2015 and January 2016. What was the date of adding my additional submissions? Why are all my submissions under 4865, other multiple submissions by the same person have different numbers. Why were my submissions originally not included? Some of the missing Charlton submissions relate to conflicts of interests and suitability of the selection of AECOM as the company responsible for the EIS. A very wide range of people shares Charlton’s concern. I note that the Submissions report records that 4054 submissions or 84% of all submissions that were counted in the analysis raised issues about the ‘adequacy and independence of the EIS’. Two of Colin Charlton’s submissions referred to AECOM’s involvement in other aspect of the EIS and legal problems it encountered in relation to its traffic modelling in Queensland. One of these submissions included the details of Westconnex contracts assigned to AECOM. Colin Charlton’s submissions provided some evidence about whether AECOM had sufficient independence to be a suitable EIS assessor and were clearly relevant to a consideration of this issue. Despite this, his assigned number 4865 is not included in the list of submission numbers under the heading ‘Adequacy and Independence of the EIS” on page 1 of Volume 2 of the Response to Submissions report. On the other hand, Colin Charlton’s number is listed under the issue of ‘Peak Oil’ on page 19 of Volume 2. I could find no mention of Peak Oil in any of his submissions. c) I have also been informed that Mary-Jane Leahy definitely made a submission. Her name does not appear on the list at all. A number of people made several submissions. Just from my own knowledge these include Sharon Laura and Pauline Lockie. The Submitters list reveals that Ms Laura and Ms Lockie were assigned different numbers for each submission. I made my own personal submission and also submitted the People’s M4 EIS (see below). I was assigned two numbers. I have provided only three examples of multiple numbers. My own examples are drawn from my own personal knowledge and therefore are a likely to be a small reflection of the total number of flaws in the processing. Why was Colin Charlton treated differently? How many other submissions are or were missing? The public should be notified when a website is changed or updated in significant ways. The Department should thoroughly investigate the processing of the EIS before proceeding. I will supply more evidence to support this complaint after I have been informed about how the Department deals with complaints such as this one. Some submissions are so faded that they cannot be read. (4879) It would seem unlikely that they were in this state when submitted. Others are upside down (e.g. parts of 4885) and therefore can't be read at all unless they are printed out. This standard of unprofessional publication is unacceptable from a government that claims to promote and implement equitable access to government information. I should stress that I have neither the time nor resources to trawl through all submissions to find the full range of errors in publication and processing. I have found these examples by going through a single one of 61 PDFs. I expect that there will be many other examples in other PDFS. “Your personal information relates to you personally and includes any information or opinion made about you. Personal information includes your name, address, phone number, email address or any information from which your identity can be reasonably ascertained. ●any other personal information contained on your submission. ● Any political donations disclosure statement. I understood from my reading of this material and indeed confirmed it by viewing earlier submissions to other exhibited proposals that the Department would collect my email and IP address as personal information. I also understood that this was inevitable, because when lodging a submission online, the information about the email address of the sender is automatically available. This online form of submission is the one that is most promoted by the Department. However, I understood from the remainder of the text that the Department would publish my name, suburb and submission unless I indicated that I did not want it to do so. I understood that only if I included my email in the text of my submission would it be published and the same applied to my IP address. This makes a lot of practical sense and the policy is presumably based on the understanding that while people might be perfectly agreeable to having their suburb published, they might be wary of having their actual address published because of concern about potential abuse or intrusion. I have been told my one submitter that she is concerned about email addresses of younger members of her family being published. I rang the Department shortly after the publication of the submissions to alert them to the publication of the email and IP addresses. The Department later informed me that if individual people wanted to have their email and IP addresses removed, they should individually approach the Department. This was an impractical and insufficient response. How were these people meant to know that this was possible or even how to find their submissions? When community organisations submit to the planning process, individuals submitting on behalf of organisations are provided with an opportunity to indicate on the Department website on whose behalf they are submitting. The whole purpose of these organisational submissions is to make it clear that the submission represents not the views of single individual but a group. This is an important role that organisations play in civil society in contemporary Australia. The Planning Department has failed to apply this process consistently in the case of the EIS for this project. For example, I submitted a submission on behalf of the community group The People’s EIS. The purpose of the People’s M4 EIS is to encourage involvement and transparency in planning and to empower the community by sharing knowledge. I am one of the editors of the group. The names of other people involved were included on the group’s submission. I object to the fact that this submission was not published under its organisational name as was done with some other groups. The EIS itself is published in an inaccessible form with little care taken to guide the public in accessing it. For example, the chapters are not labelled in any clear way. Appendix G in the small file format is just broken in the middle of a section. By publishing the EIS and the agency submissions in PDF format, the Department has also ignored the requirement to publish an alternative to PDFs, preferably in HTML. These alternatives are required to be published at the same time and not merely be available upon request. Some public submissions were submitted in PDFs form but many others were in web format. Why were these reduced to PDFs? This practice can be contrasted with that adopted for the Northconnex projects where PDF submission were published as PDFs but online submissions were published in easily accessed web submissions. As I am sure your Department staff are well aware, the requirement to publish in alternative accessible formats has been established to make information accessible to the visually impaired, as well as people with other disabilities that make it difficult for them to access PDFs. Take for example, the NSW EPA’s response to the M4East EIS. This is a key document that many of those interested would want to read, including the visually impaired. This document is not only published as a PDF when an alternative format would have been easily available, but even worse, it cannot be copied or reproduced in any other format at all. It appears to be a scanned image. https://majorprojects.affinitylive.com/public/f81d9b03e5a85cc6b656b7f9168b8eb8/09.%20EPA%20EIS%20Submission.pdf Surely government departments can communicate between each other so that information can be supplied in an accessible way. The Department’s failure to provide these submissions in an alternative format is clearly a breach of the government’s own standards. All Australian, state and territory government websites are expected conform to Web Content Accessibility Guidelines (WCAG) 2.0 AA standards. 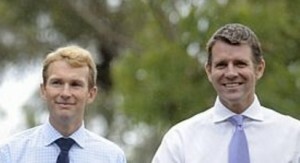 It also places the Department in potential breach of the NSW Discrimination Act. This particular complaint needs be considered in the context of all the other examples of errors in the publication process. The Department’s standards of publication overall do not meet high accessibility standards and need overall review. However the approach to publishing for this particular project displays a dismissive attitude towards the public, many of whom are highly affected by decisions. The poor publication practices have limited the potential for the public to access, interpret and respond to information and have thus undermined the planning process. 5. Updating of Response report without any clear notification to public. I am aware that I am not the only resident to complain to the Department. Following other complaints to the Department of Planning about failure of RMS and Sydney Motorway Corporation (SMC) to respond to submissions, SMC was allowed to update its response report without the public being notified. At the very least the public should be informed when websites are updated because of the failure of proponent to supply correct information. I am aware that this has happened. I am making further inquiries about this and will further more information to you on this particular complaint. Submission authors have instead been assigned a stakeholder identification number. Letters have been sent to each submission author (where contact details have been provided) to advise the authors of their unique stakeholder identification number and the availability of the report. Approximately 231 submission authors selected not to disclose their contact information; therefore these individuals have not received a letter. It is quite clear that the Department expected most submitters to communicate via their email address. In fact it has published thousands of these email addresses. In addition, thousands of members of the public included their addresses in their submissions, which the Department has published on the web. I can supply names of many people who made submissions who did not receive letters. I did not receive a letter myself. The last statement in the quoted extract can only be interpreted as meaning that more than 3500 letters were sent. This is a false statement. Someone must have decided to make that statement. Who authorised the RMS to make the statement? Who in the Planning Department stated that this procedure would be followed? Why, if indeed it was ever intended that it should happen, was the procedure not followed? This is a serious matter that requires urgent attention. By failing to communicate properly and fairly with the public, the Department has substantially failed in its requirement to consult with the public. It would of course have made sense for your Department to write to submitters because otherwise how were they to find their submission in the Response to Submissions report. In fact, I am not aware of any people who received these explanatory letters. I am aware that the procedure outlined on page 3-1 has been followed in other major projects. The 231 submitters who asked for publication confidentiality only and like other submitters did supply contact information and were as entitled as anyone else to receive communications from the Department and be informed by the department as to how it was dealing with this submissions. There could be all sorts of reasons for requesting confidentiality - fear of violence, for example. This does mean that a person does not want to receive private communications from government departments. This complaint is a very serious one as it involves false statement that must have been either knowingly made or made without knowledge as to whether they were true or not. The Response to submissions report refers to some submissions being redacted before they were sent to the RMS for response. What was the basis for these redactions? Were individuals who submissions were not fully processed by the proponent notified of this fact and the reasons why? The Department of Planning does not appear to have submitted a complete set of submissions to the proponent or to have processed them systematically. The consequence of this is that those responsible for preparing the Response to Submissions have not dealt with a complete set of materials. It has published false statements to the public about the steps that it has taken to process submissions and its dealings with the community. It is a matter of great concern to me that submitters and citizens are being treated in different ways and some more seriously than others. It is also of concern that citizens will disabilities are not being provided with opportunities to access material online. As others have noted in their submissions, the Westconnex Community method of consultation is far below international best practice. The public submission process is an important part of the limited opportunities for community engagement that do exist. Your Department carries responsibility for this process. A mishandled and incomplete process that is lacking in consistency and transparency cannot lead to reasonable decision-making. As stated earlier, I regard this matter as urgent; the matters that are the subject of this complaint and the many other complaints about Westconnex planning processes that are documented in submissions undermine the legitimacy and acceptability of planning decisions in NSW. You will be as aware as I am of the history of corruption around development decisions in this state and also of failed badly planned tollway projects. Such low standards of public administration as demonstrated by the handling of this project are not acceptable and suggest a deeper problem. I am concerned that the unfair and unsatisfactory procedures may be adopted in the New M5 project process as well as the M4 East process. As advised by the website of the NSW Ombudsman, I am sending this complaint to my local MP Jenny Leong. I will also send it to other MPs who have demonstrated an interest in the project. I will forward a copy to the Minister for Planning Rob Stokes and the Premier. Given that the WestConnex New M5 EIS submission process is already underway, with another unreasonable deadline imposed, I ask that you deal promptly with this complaint. Please let me know as soon as possible how you will deal with it and whether you require more information from me to proceed. I have sent a copy of this complaint to the Premier Mike Baird and the Minister for Planning Rob Stokes. His email bounced back without explanation. His private secretary sent me his new web portal for letters but how anyone was meant to know about that, I'm not sure. I guess it's understandable in the busy holiday period - if so it's an excuse he's not accepted from residents, schools and local councils, which must have their responses to the massive EIS for the New M5 in to the Department by January 29th, 2016. I've also sent it to my local MP Greens Jenny Leong. I just checked the parliamentary site and they have fixed it already. Now that's efficiency for you! Don't forget to send me any ideas or information and in the meantime follow the People's M4 EIS and the People New M5 EIS sites. Subscribe and you'll get updates. 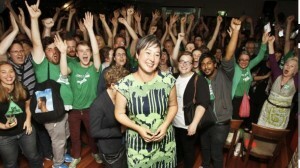 Jenny Leong on election night in Newtown, March 2015. She has continued to campaig aganinst the WestCONnex. She's provided a way to add your own comments on her New M5 EIS submission site.